Mathematics Colloquium: To err is human and computers can do without it. 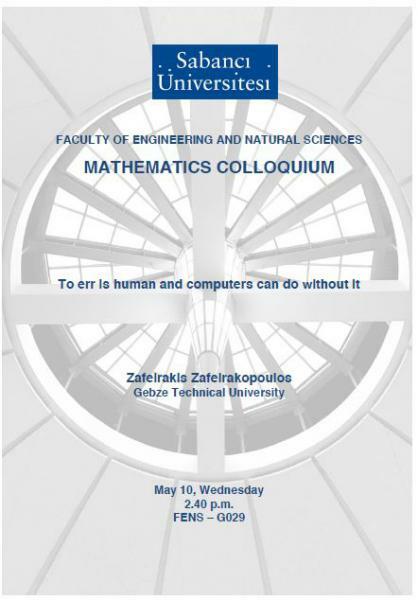 FENS Mathematics Mathematics Colloquium: To err is human and computers can do without it. Title: To err is human and computers can do without it. Abstract: This talk is a smooth introduction to symbolic computation. From representation of numbers to algebraic systems and from combinatorial and number theoretic to geometric problems, we will explore the possibility of performing exact computation. Although for many decades numerical analysis dominated the area of applied mathematics, the rise of symbolic computation, due to the recent increase in computational power and memory, is challenging the standard paradigm. The goal of this talk is to provide the necessary concepts and tools so that working mathematicians can incorporate symbolic computation in their daily workflow.